What? 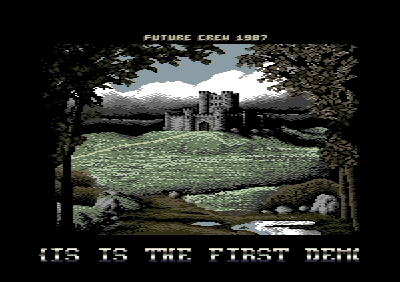 I never knew FC did something on the C64 at that early age! Is it really the same Future Crew? Optimus: Check Future Crew's Wikipedia Page. It was in all their group info files.. Pretty not good.. ;) try to press space, btw. Fun fact; Demo 1 (FC1) wasn't coded by FC but was made using Lettermaker 5 by Future Projects. FC WAS ADVANCED ALREADY IN 1987!! !11 DEMOMAKERS ARE NOT A CRIME1!!! If this is really from 1987 this is older though. Technically advanced? Surely not. Widely spread? Surely not. The Name Bonus? Surely yes. Overall I would be really hard pressed to give this a piggy. Even considering it's a first demo and the year was 1987. But here it goes then. It's a joke and/or pimping a side project. LM5 is just a note-file maker and doesn't support any of the features shown in this demo. page created in 0.015646 seconds with 15 queries.